I couldn't quite tell you why, but for the longest time I've been somewhat moderately obsessed with pedals. Since I'm no guitarist I don't really have a valid reason for this, other than the fact that they both make pretty noises and are rather nice to look at. Much, really, like the folks who use them. I've decided to turn my inexplicable pedal fancy into Fuzzy Logic fodder, and I do hope you'll enjoy my foray into the ins and outs of pedal worship. Mittenfields, o Mittenfields. Why is it that sometimes bands sound much better when they have not one, not two, but three guitarists? See for yourselves when Mittenfields takes the stage at the debut of the Fuzzy Logic Bad Behaviour night on May 19th over at Bella. While you're impatiently waiting for that night to get hear (don't worry, we'll have earplugs for you), here's the third arm of their tri-axe assault, Donald Seale, opining on all things pedaltastic. Oh, and Toneczar? Hows about a little endorsement action. Also, "Fog," for your listening pleasure, is another v 1.0 song. Newness coming soon, y'all. Epic. 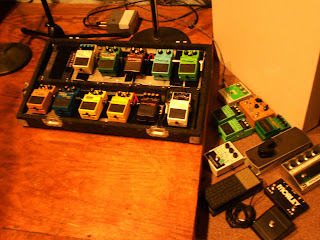 Fuzzy Logic: Which pedal is your very favorite, and why do you love it so? Donald Seale: It's kind of a boring answer but I think my favorite is my Homebrew Electronics Compressor. It's a quieter version of the Ross compressor circuit. Pretty much what it does is even out the loud and quiet sounds and add sustain and presence. It just sort of makes everything fat and smooth. I don't think anyone even notices it's on unless I turn it off. I never turn it off. So since that doesn't really count as an "effect" I will say it's a toss up between the Moog Phaser and The Red Witch Medusa Chorus/Tremolo. The Moog Phaser makes this ridiculous whooshing sound as well as these potentially nauseating swirly, watery noises. It's like psychedelic maaaaan. Plus it kind of looks like the control panel in the dash of a sweet 70's conversion van, the kind with a heroic barbarian warrior slaying a dragon and rescuing a mostly naked princess or stunning mountain sunset airbrushed on the side. The Red Witch Chorus is lets me get a nice subtle shimmer or really violent, choppy volume effects. I can even combine the two features so that the rate of the shimmery part is in time with the pulsations of the volume. It also does pitch vibrato. It's just super versatile, one of a handful of pedals that I have never considered replacing. I have to confess to enjoying the fact that for a long time there were only 74 of them out there, so it's unlikely to end up playing a show with someone else who uses one. I guess that would be the guitar player version of showing up to a party and finding someone else is wearing what you're wearing. Also, I really like Mike's Skreddy Zero and used it on almost every song that we recorded on our upcoming EP. FL: What's your favorite chord? DS: I really want to sound like I know what I'm doing and tell you that it's this A9 chord with a C# in the bass where the 9 and the 4 ring out on open strings. I do love that chord. I got it from my favorite Steely Dan song. The truth of the matter is that my favorite is an open E chord played with a ton of overdrive through a really loud amp. I like to let it ring out until I'm enveloped by feed back. One my favorite things to do for non players is to show them how to play an E chord and just let them feel it through a really juiced amp. Everyone needs to try it once. FL: Who's your guitarist icon? DS: One of the first guys that made me think "hey I could do this" is Neil Young. I love how takes really simple elements and makes something greater than the sum of it's parts. I also really respect the fact that he doesn't really let himself stagnate. He can do country records, loud feedbacky garage rock records, ambient soundscapes, just whatever he wants and if it sells great if not whatever. I just like that really primitive kind of lead guitar playing where it sounds like it could all fall apart at any second but never does. That said, the older I get the more I like guys who are more restrained and confident. I mostly listen to Grant Green, my favorite soul jazz player if I really want to be humbled by absolute genius guitar playing. He did two records in a row on Blue Note; Am I Blue and Idle Moments that are just devastating. His note selection and phrasing were impeccable. FL: With all the pedals out there, how do you decide which ones you have to have? DS: I spend an embarrasssing amount of time on the internet checking out effects. I also like to talk to other players and when I get the chance I like to get a look at the boards of players that I'm impressed with after shows. It's pretty geeky and obsessive. FL: What's your dream pedal/pedal you're currently coveting? DS: I'm not coveting any specific pedal at the moment (except maybe Mike's Zero) but I am usually somewhat dissatisfied with at least one of my units. I feel like I need a delay with sharper repeats, a more transparent overdrive, and a fuzz that cuts through the mix a little better. I have my eye on several but there are so many builders out there now that it might take some time to find the perfect ones. Now, if money were no object would say the Toneczar Echoczar. It's a multi channel analog stereo delay with all kinds of crazy control options and weird things that can be done with the timing of the repeats. I just can't pony up thirteen hundred bucks for a delay pedal with a two year wait list though. Maybe when Mittenfields blows up I'll get endorsed. Just putting that out there Toneczar; I'm accepting endorsements.